HomeWho are the players? Cameras huh.. The metal channel on the top is mostly small plastic circuit breakers, looks like ABB brand. The smaller blocks at the end are made by Omron and for some reason, they decided to hang capacitors (yellow) on them. The DC power supply is made by Idec and appears to have a single 12 volt output. 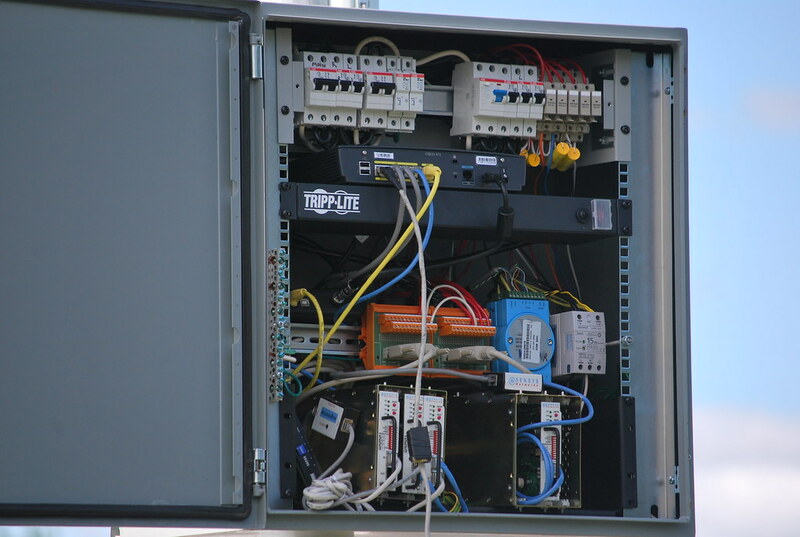 The Tripp-Lite box is probably a surge suppressor and outlet strip. I looks too small to be an uninterruptible power supply. From the Sensys Website, it loots like the modules on the bottom are a model “CC” traffic module but I was not able to find any specifications. I was never very impressed with European style electrical enclosures. My choice would have been a NEMA designbox.